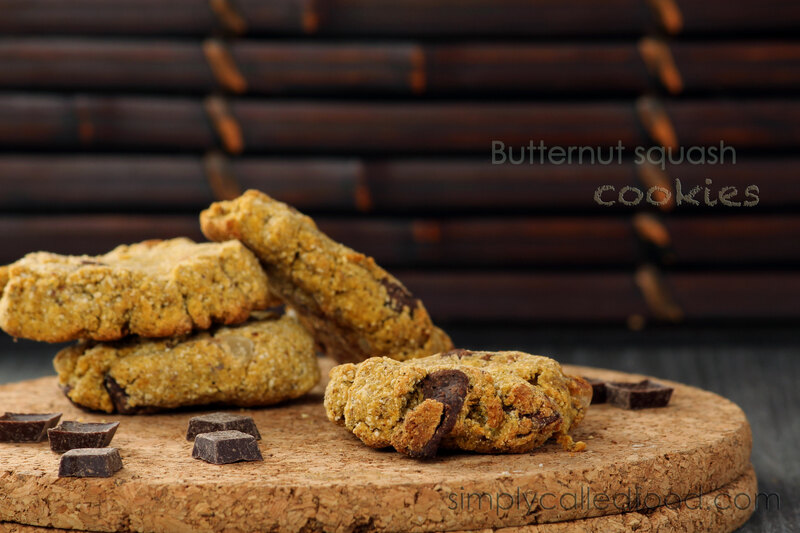 Butternut squash cookies | Simply called "Food"
We are still right in the middle of winter. We have been getting plenty of snow since Christmas, which is good for outdoor sports! In the other hand, the choice when it comes to veggies, is pretty limited. We have the cabbages, root vegetables and the squashes. If we want to eat with what’s available in season, that’s pretty much the choices we have. You could make this recipe with actually pretty much any squash that has a dense and creamy flesh when cooked. You could also use sweet potatoes, which can be very interesting in desserts. In a small bowl, combine the grounded flax seed and the water and leave aside for 10 minutes. It makes your egg replacer. In a medium bowl, combine the tapioca flour, the buckwheat flour, the sorghum flour, the coconut flour, the baking soda, the baking powder, the cinnamon and the salt. In another bowl, beat the coconut oil, the brown sugar, the vanilla and the butternut squash. Add in the flour mix, the almond milk, the flax seeds mix until you get a nice smooth batter. You can now put in the chocolate chips and the walnuts. Pour your batter on your cookie sheet and put in the oven for about 15-18 minutes. Let them cool a bit before you transfer them on a wire rack. Tags: Butternut squash, Chocolate chip, Cookie, dessert, Food, Fruit and Vegetable, Gluten free, Nuts, Recipe, Vegan, Vegetarian. Bookmark the permalink. Oh Annabel! Squash in cookies = good. And cookies in Winter = better. I must make some. DUDE! Butternut squash COOKIES?!? Our freezer is full of butternut squash from the fall so this is PERFECT!